Nonsuch Bay is a luxury private resort surrounded by forty acres of beautifully landscaped gardens with ocean views and its own secluded beach. In its design and everyday culture, Nonsuch Bay offers residents and visitors alike an authentic Antiguan experience within this very elegant setting. Choose between exquisite one, two and three bedroom apartments, beach cottages, and waterfront and hilltop villas, all designed in the West Indian Georgian Colonial Style, with tall ceilings and French windows to encourage ventilation of tropical breezes and wraparound verandas to invite outdoor living. 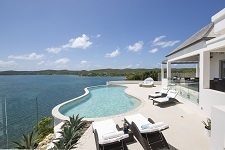 There are three infinity swimming pools, including a clubhouse pool with dramatic views over the bay. Guests are invited to be as relaxed or as active as they please with customizable packages to ensure you pay only for what you want, guaranteeing value for money. We offer all inclusive or accommodation only stays, with options to have fully stocked fridges upon arrival. The protected bay and consistent cool trade winds are outstanding for sailing and the resort offers first class equipment, including dinghies, catamarans and keelboats, and offers professional instruction for all ages and abilities. Guests can enjoy exploring the bay by kayak or paddle board or some kite surfing can be arranged. Other beaches and snorkeling opportunities are all around, a quick boat ride away. Teens can now participate in an Epic Teen Challenge – a three-sport triathlon-style competition that incorporates sailing, kayaking and swimming in two categories. The Bay restaurant is located on a bluff overlooking the tropical waters of Nonsuch Bay. Carefully designed to make the most of the dramatic site, diners are seated at tables on a cascading series of terraces contoured along the edge of the hillside. An experienced team lead by Executive Chef Mitchell Husbands has created menus that draw inspiration from around the world. During the day the menu emphasizes fresh, simple Caribbean and international favourites. In the evening diners can relax in the club lounge for cocktails and hors d’oeuvres, while choosing from a sophisticated Asian and international-inspired dinner menu and extensive wine list. Nonsuch Bay Resort offers an inimitable day pass offer (inclusive of tax and services) of US$120.00 per person and US$80.00 for children under 12years. A room for changing purposes if you are joining us for dinner. Our aim is to make your stay enjoyable. We look forward to welcoming you! Enjoy in-room spa service with a large selection of treatments, including body scrubs and wraps, facials, massages and waxes and care for hair, hands and feet. Indulge in relaxing and revitalizing treatments, without having to leave the privacy of your luxury living quarters. Nonsuch Bay is a fabulous environment for children with a wide range of activities on offer for all age groups. Packages can be customized and our experienced staff is available in the mornings and afternoons to keep your children entertained with a vast selection of indoor and outdoor activities. Take the opportunity to hire a car and explore Antigua. Outside the resort the range of available activities includes a choice of golf courses, game fishing, scuba diving, yacht charters, island tours by land and sea, marine safaris and - for the more adventurous - zip lining through the tropical forests and helicopter tours, including over the island of Montserrat and its awe-inspiring volcano. For dining outside of the resort, there are many diverse places to eat on the island. We can arrange for a club launch to take you across the bay to eat at Harmony Hall or make you a reservation in English Harbour where there is a lively nightlife. All in all, this luxury resort is perfect for families with children or grandparents, on an island packed with fun-filled activities, vibrant culture and diverse interests. 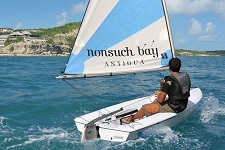 Perfect for a weekend retreat or a wholesome family vacation, Nonsuch Bay Resort is ideal for the discerning traveler.